The first step to increase power and performance from modern engines is to help them breath more easily and then ignite the fuel as quickly and fully as possible and finally to remove the waste gases efficiently. High quality ignition leads combined with the very best spark plugs will ensure the maximum explosion in the combustion chambers and therefore create more power. The exhaust gases need to get out of the way as quickly as possible therefore a new free-flow sports system will be necessary to take full advantage of potential increases in power. For cars fitted with a turbo we can offer a dump valve to get unwanted gases out of the way efficiently. Also for cars with diesel engines we can offer special upgrades depending on the exact make and model of car. We can also offer upgraded ball bearing turbos and intercoolers, silicone hoses, boost control kits, wastegates and turbo boost gauges to keep you in full control. A turbo timer will also keep the turbo spinning after being driven hard in order to cool it down and circulate the lubricant, prolonging your turbos life dramatically. Talk to us about your power requirements. We will be able to help and can offer full fitting facilities at most of our Carnoisseur Outlets. 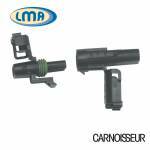 Carnoisseur have a full range of LMA Connectors. To view the LMA Connectors we offer simply make your selection below. You can purchase LMA Connectors on-line or through our network of Carnoisseur Outlets. To find out more about Engine & Tuning click here to view our Carnoisseur Engine & Tuning Guide.